In the dimensions we live in, we always have something good and something bad, sunshine or rain, love or hate, protons with positive charge or electrons with negative charge. 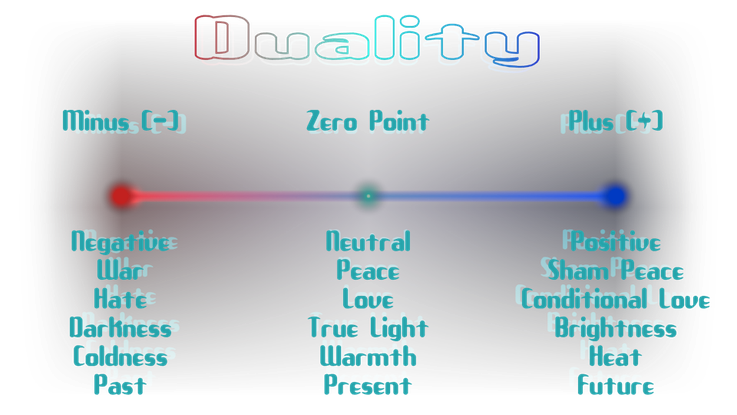 All humans who did not accept themselves 'as-be', all humans who did not understand the energy principle behind everything, are a variable at one point between the polarities at the axis shown below (those in principle are all of us). This axis picture is for getting a better understanding for the thoughts of duality in accordance to polarities. There will only be a change, if we recognize the limitation of all human judgments inside ourselves! We don't need to be afraid anymore! We should not fight, reject or condemn the listed Minus-Poles, instead we should use them as engine, transform and finally neutralize them. We could do this with conscious thought hygiene and thought control! To translate this more scientific explanation, you could watch the following few examples from the normal life, so that we can start to feel like a human and not just like a slipping variable on the axis, rather to feel us like a constant at the neutral zero point! Example Peace/War: As far as we refuse and fight the dark side in the outer and inner self, our mind/ego starts to feel like a peacemaker! But in this moment it does not notice, that it slips to the Plus-Polarity, into the sham peace. Sham peace because it fights the "darkness", and fighting does never have something to do with peace. The solution would be in this case, to deprive war any energetic and mental attention! We reach this, by stopping to deal with war in the outer, the news/the media/the social media. Example Love/Hate: In love relationships people often sacrifice themselves for their partners and use to act with the typical helper syndrome where they tell themselves "Oh me poor, selfless, heartfelt being". They do not realize that this is for their own ego, which gets appreciation through this continuous giving and helping. These people are to much in the Plus-Polarity and give conditions to their partners without noticing. Solution in this case as well, a state without judging! No side in such dependent relationships with the love ability described above, is better or worse. The constant, neutral zero point is only reachable by activating or finding self love! Than, caused by the law of resonance, we will find a partner who also feels self love. After that we can live "true love" in reality. Example Warmth/Coldness: For better understanding of polarity actually not necessary, a commonplace terrestrial example, which we can not neutralize to zero point in our physical and material dimensions. But we can learn to deal with the opposite polarities more consciously. In the winter if it's cold, we freeze, shiver, and deny the coldness. We wish heat, but we aren't conscious about, that we can only feel heat, because we are able to feel coldness. One is dependent from the other and we should appreciate both polarities, and feel much more gratitude for the temperate climate! By going through life in a conscious way, we could feel gratitude for everything. 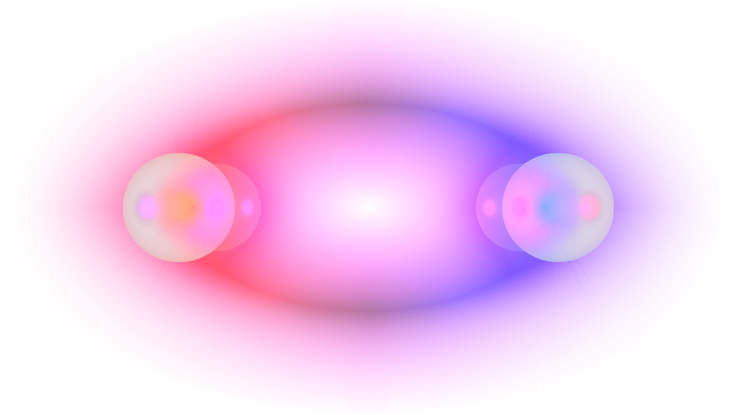 The examples for duality and polarity are almost infinite. Another one is our imagination from "past" and "future", also an aspect of duality, because we actually always live in the "present" in the "now". The "male" and "female" on earth is an aspect of polarity, because on the soul level we exist in androgyny and have both parts inside of us, which we also should harmonize in our physical dimensions, so that we get into balance and find inner peace. For all that didn't know, how we could handle the own inner, global bright-dark-war, and for them, that didn't have an exact imagination of duality/polarity, I hope that these words were understandable. This text was translated and changed by Celestial Core Productions. Original text was written by Juliane July in German language. Thanks for this amazing article. Click here to view it.